Here comes yet another drone-zapping laser: A German missile manufacturer built this Death Star-like beam to protect world leaders. And it works, too: in a field test, it took down a mini-drone in three seconds flat. The laser was teased in a video at this year’s Paris Air Show earlier this month—a video that sadly, we can’t seem to find. We do know how it works, though: multiple beams merge into one in trademark Death Star-style. 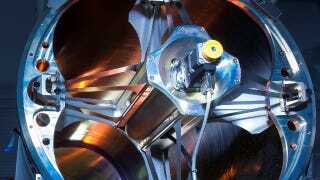 Four 10-kilowatt lasers are focused into one using a mirror. That beam is automatically guided by an optical sensor to a target. They also say the laser is small enough to be loaded into a vehicle. We’ve been hearing about drone-killing lasers for over five years now, and MBDA Deutschland joins the US Navy and Chinese researchers as laser makers who want to ground potentially dangerous unmanned aerial vehicles. For some comparison, the Chinese laser apparently has a range of 1.2 miles and can down a drone in five seconds. This new German one took a mini-drone down in three, but that mini-drone was only about a third of a mile away. The company wants the laser in place for the world leader-filled G7 Summit in Japan next year. Japan’s a country that’s been pretty anti-drone this year. Back in April, a drone carrying radioactive material was found atop Japanese Prime Minster Shinzo Abe’s office. Drones were banned from public parks in Tokyo a month later. Security is especially at the forefront of people’s minds with Tokyo’s 2020 Summer Olympics nearing. It’s probably just a matter of time before we see a company making laser lightsabers for drone duels. Poor drones. They’re just misunderstood!